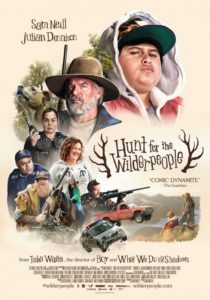 I first heard about Hunt for the Wilderpeople when I was reading about the upcoming Thor movie, which is also directed by the same person (Taika Waititi). I was excited about it from the minute I read about it – I’ve been enjoying non-American movies more and more recently, and it seemed like it would be an enjoyable kind of quirky. Ricky Baker is a orphan with a history of getting into trouble, and the only family that will foster him live out on a remote farm. To his surprise, his foster mother is kind and patient, and he’s actually found a real home – at least until she dies suddenly. Now child welfare services wants him back, and through some unfortunate circumstances, he ends up on the run with his curmudgeonly foster father Hector (Sam Neill) in the bush. His child welfare services offer, Paula, takes his escape personally, and a intense manhunt commences. This movie reminded me a little bit of Moonrise Kingdom, although without all the Wes-Anderson-ness. It’s funny and cute and full of heart, and the actor who plays Ricky is amazing. Sam Neill hasn’t really gotten that much better with children than he was in Jurassic Park, but that’s exactly why he’s so good in this role. I highly recommend this one! Akeelah Anderson has always been great at spelling, although she tries to hide how smart she is from her classmates because she’s afraid of being bullied. Her teachers and principal notice her talent and push her to compete in regional spelling bees to have a shot at the Scripps National Spelling Bee. I liked this movie a lot – it’s a typical underdog story, but I found it a more realistic portrayal that similar movies. Akeelah has to overcome her own self-doubt and embrace her ability and who she actually is rather than trying to fit in. The cast is great too – Angela Bassett plays the mom and Laurence Fishburne plays the curmudgeonly mentor, but Keke Palmer absolutely steals the show as Akeelah. I remember enjoying this movie when I first watched it more than eight years ago but I didn’t remember any details about it. I’m always fascinated by the idea of little decisions having a big impact on how things turn out, and Run Lola Run is probably one of the movies that examines this best. After receiving a panicked call from her boyfriend, a small-time criminal, Lola has 20 minutes to acquire 100,000 marks and get them to him to prevent his boss from killing him (literally). The movie shows us three iterations of her 20 minute run and how each turns out. It’s a fast-paced movie, there are a lot of details to pay attention to (as is often the case with this kind of story), and it’s just very well done. Watch it! Kiss Kiss Bang Bang writer/director Shane Black is back again with another black comedy neo-noir buddy cop movie set in Hollywood, and it’s almost as good. PI Holland March (Ryan Gosling) and enforcer Jackson Healey (Russell Crowe) encounter each other (violently) while investigating different angles on the same case and eventually decide to team up. This movie is set in the 70s, and that’s actually a big part of its atmosphere – it doesn’t happen to be set in the 70s, that fact defines its identity. The comedic elements are funny and the characters have heart, especially thanks to March’s (precocious, of course) daughter Holly. I would have liked it more if it had been a little bit more serious, but it’s still a good movie. I wasn’t expecting a lot from Despicable Me based on the trailers, but it turned out to be surprisingly good. Our protagonist is Gru, an aging supervillain who is trying to pull off the biggest heist of his life. In order to retrieve the shrink ray (needed for the heist) that a rival supervillain stole from him, he adopts three young girls from a nearby orphanage. They turn out to be more than he bargained for, and his whole life turns upside down. The three girls are absolutely adorable, and it’s nearly impossible not to fall in love with them. Without them, the movie wouldn’t be anywhere near as good, even with all the great voice actors. Newly retired supervillain Gru and his three adorable daughters are back. Gru is recruited by the Anti-Villain League as an undercover agent to foil a dastardly plot involving a serum that turns anything that drinks it into ravening monsters. In addition, he also has to deal with eccentric AVL agent Lucy Wilde, his daughter Margo’s first crush on an entirely unsuitable boy, and the resignation of longtime employee Dr. Nefario. These movies aren’t deep, but they’re cute and a lot of fun. I particularly liked Dr. Nefario’s role in this one. Lucy annoyed me in the beginning, but she grew on me by the end. War Machine is a satirical look at the war in Afghanistan through the eyes of General Glen McMahon, who is sent to command the NATO forces and help “win the war”. It is a thankless job in a very complicated situation, but McMahon is idealistic to a fault and believes that he can really make a difference. I wanted to like this movie more than I did – the actors do a good job, especially Brad Pitt, who plays the protagonist. Ultimately it seemed directionless and more like a farce than a satire – everything is so over the top that it doesn’t end up saying anything consequential.